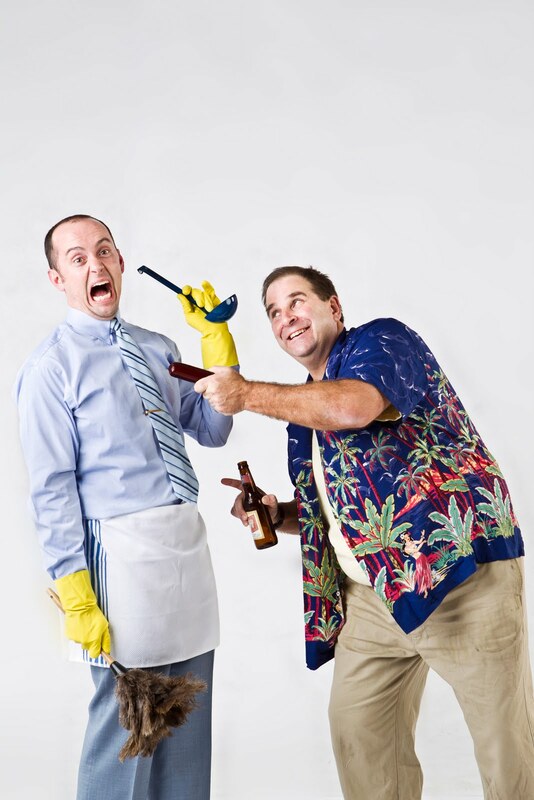 Anthony Clark-Kaczmarek and Edward Cutler, the stars of the Omaha Community Playhouse’s (OCP) upcoming production of The Odd Couple, are quite different. On the surface they do indeed seem like a rather “odd couple”, but after spending a little time with them, you witness a real camaraderie, probably not unlike Felix Ungar and Oscar Madison…before they moved in together. Anthony, who plays Felix, is an Assistant Principal at Nathan Hale Magnet Middle School. He is also a seasoned actor who has won many awards throughout his acting career—a career that began at Nebraska Wesleyan University. At Nebraska Wesleyan, Anthony was in a play directed by Judy Hart, the director of The Odd Couple. In this play, Anthony met and fell in love with his cast mate Kim. Kim, who is playing Cecily Pigeon in The Odd Couple, and Anthony are now married and have a daughter Stella. This is the first time since that fateful play that Judy will once again be directing both Kim and Anthony in the same play. Since the launch of his acting career, Anthony has starred in many productions, including his award-winning performance in Death of a Salesman at OCP last season for which he won Best Supporting Actor. Edward hails from a different background completely. His entrance into the theatre world is a little more recent. The theatre bug bit Edward after acting in productions at the Fremont and Gretna Community Theatres and taking an acting class at OCP. He landed the role of Oscar Madison in the upcoming production of The Odd Couple, his first role at the country’s largest community theatre. Acting history is not the only area where Edward and Anthony differ. Formerly in the military, Edward works as an Anesthetist in Fremont. He resides in Papillion, NE and is married and a father of four. Anthony and Edward may come from different experiences and backgrounds, but bring them together and throw in Director Judy Hart and the results are absolute hilarity! Don’t miss The Odd Couple in the Howard and Rhonda Hawks Mainstage Theatre, Jan. 21-Feb. 13, Wednesday-Saturday at 7:30 p.m. and Sunday at 2 p.m. and 6:30 p.m. Tickets are $35 for adults and $21 students. For groups of 15 or more, adult tickets are $23 and student tickets are $15. To purchase tickets or for more information, call (402) 553-0800, visit the Box Office or click here.